Good Morning Readers, Lindsay here! 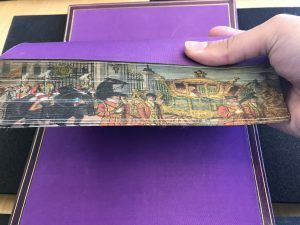 I am back today writing about the mysterious works of art that are fore-edge painted books. This week I would like to focus in particular on the Coronation scene of Queen Elizabeth II leaving Buckingham Palace, 1952, on Richard Dimbleby, Elizabeth, Our Queen, 1953 (Knott Collection 252). In case you forgot what this looked like, I have provided a picture below. I believe that it is important for you all to have a better understanding of this artistic phenomenon. 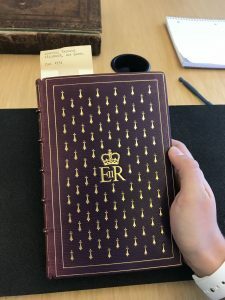 Therefore, for this post in particular, I want to focus on the history of the fore-edge painted books and how Dimbleby’s fits into the succession of these types of books by way of context clues. Hopefully after reading this you will to be able to find some clues to help me solve this mystery. 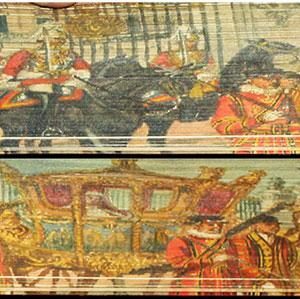 Starting from the beginning, scholars estimate that the fore-edge painting technique developed around the years of 1660-1683. Samuel Mearne, the royal bookbinder to King Charles II, is originally credited with this innovative production of art. However, the Edwards family of Halifax produced a significant number of these books in the late 1700’s that have led many to assume that the firm of Edwards of Halifax produced the first fore-edge painted books. They merely continued the tradition. This firm was influential in the continuing popularity of fore-edge painted books, because not only did they possess the capabilities to bind these books but also had the artistic skill to paint the fore-edges themselves similar to Samuel Mearne. In my previous blog post “‘Fore’ Mystery Lies on the Edge,” I discussed how I wanted to continue my research on the theme that the paintings commonly depicted either symbols or subjects of royal families or upperclass people. Now that we know the original techniques were presented to Charles II, it provides us with early evidence that these particular classes of people were interested in acquiring these artworks. I think it is safe to assume that people from these classes would not necessarily want scenes of peasants depicted within the pages of their collections. Unless of course it was the mid-19th century and depictions of the everyday lives of peasants and the laboring class were popular. An example of this can be seen in the works of Millet and Courbet after 1849. This makes it more likely that paintings depicted were of sophisticated subjects. One of my colleagues, Lillian, is working on a fore-edge painting from 1772 showing the coats of arms of eight Oxfordshire families; yet another sophisticated subject. Although Dimbleby’s book contains scenes of royalty and presents the sophistication and grandeur of the upper class, I have recently decided it is different. 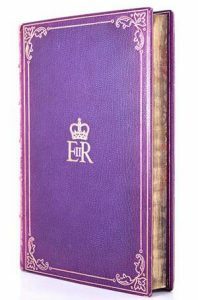 The book itself was published by Hodder and Stoughton in 1953. This is almost 300 years after the original fore-edge paintings were completed. It also alludes to the fact that both the binding and the painting must have been done at a later date. Not to discredit my original idea that upper-class, highly sophisticated themes were depicted. But based on a recent discovery, I can conclude that the painting on Dimbleby’s book was not unique to the book itself, but instead was painted as one of many that may have been used for the purposes of decoration to elaborate on the contents of the book itself. I recently found another copy of this book for sale. The book possesses a different binding than the Knott Collection copy, but the painting is exactly the same. Below I have provided you with first the copy from the Knott Collection and on the right the other copy for sale. I have to say that I was mildly disappointed to see that the painting on the book in the Knott collection was not unique. However, I want to continue my research and see if one of these artists copied another. Hopefully, I will be able to figure out who painted the scene on the book in the Knott Collection. Until next time! Coronation scene of Queen Elizabeth II leaving Buckingham Palace, 1952, on Richard Dimbleby, Elizabeth, Our Queen, 1953, painting by Vera Dutter. Weber, Carl J. “Fore-Edge Painting, A Historical Survey of a Curious Art in Book Decoration” Harvey House, Inc., New York. 1966. Print. Comments Off on Anyone find any clues?